Tompkins County school and community groups are welcome to tour the Recycling and Solid Waste Center at 160 Commercial Ave in Ithaca. Tours take place during business hours. 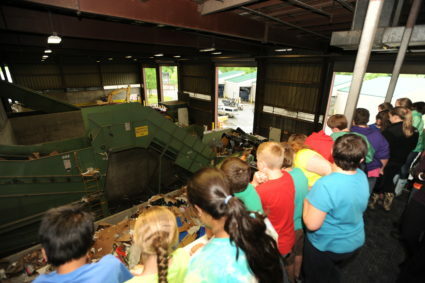 A tour of the Recycling and Solid Waste Center. Tompkins County groups that cannot visit the Recycling and Solid Waste Center can request a 4R presentation for their classroom. Similar to a tour, the presentation includes information about the 4Rs and, if requested, a 20-minute hands-on activity that integrates the 4R concepts discussed in the presentation. To schedule a tour or presentation, please contact us. Please propose several prospective dates and times. Please allow at least two weeks for staff to review your request. The Dept. of TCRMM is also directly involved with the Tompkins County School Districts, green teams, summer camps, after school programs, and youth groups. 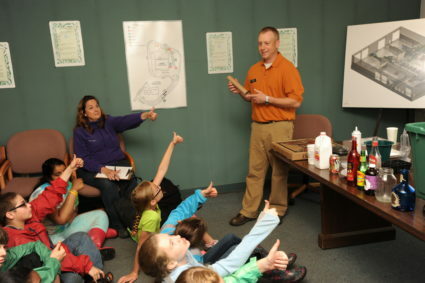 We actively participate in the Ithaca City School District’s Green Team meetings during the school year, providing support, expertise and feedback to staff, administration and students. In addition, we provide an electronic monthly “Green Teams Newsletter” to school district green team members. These may include Department updates, grant opportunities, educational resources, community events or programs, suggestions and ideas.